What Support can be given? Oliver Nicholls – Gordon E. Moore Award winner at ISEF 2018!! Designed and constructed an innovative device or application that is an original application of technology that solves a need or problem. It can be a new or improved device or process that clearly incorporates a technological idea or concept. ICT-based projects in a technological context are also eligible. Built a working scaled or full-scaled prototype of the invention or innovative device or application. Produced an accompanying design folio or logbook documenting background research and the design process, from brainstorming to final design, through construction to final product, testing and evaluation. The judging rubrics for the Working Technologically category provide further details of what is expected. Our survival guide for primary teachers is also a great resource for teachers interested in this category of awards. Entries for the Years K-6 OSHClub Inventions and Innovations Awards category are due on Friday 6th September, 2019. Entries are to be hand-delivered to the Professional Teachers’ Council (PTC) office at 67-73 St Hilliers Road, Auburn between 1pm and 4pm. Students, teachers, parents or any other designated person are welcome to set up the student entry during this time period. Winners of the Working Technologically category awards will be announced at an Awards Ceremony from 2 p.m. on Saturday 7th September at the PTC offices. Projects should be picked up on Saturday 7th September by 3 pm following the Awards ceremony. For those who are unable to set up their model at the PTC Office in Auburn, eg. regional students – video footage of the innovative device and a soft copy of the folio must be uploaded onto our registration system before 4pm on Friday 6th September, 2019. Design folio or logbook that documents prior background research and the design process, from brainstorming to final design, through construction to final product, testing and evaluation. The design folio or logbook must also include an acknowledgement of any assistance given. Unlike scientific and mathematical investigations, the design folio or logbook should be a hard copy. There is no golden formula for the structure of a design folio or logbook but it should include all the sections that are listed on this page. (Optional) Electronic storage device which contains photos or video footage of your invention or prototype in operation. After judging finishes on Saturday 7th September, students are strongly encouraged to arrive at the PTC office at Auburn at 1pm and spend time with their project and demonstrate their device to the visitors and guests who will be attending. Come dressed in school uniform as the Presentation Ceremony will follow on from this Exhibition. The Presentation Ceremony will commence at 2pm in the PTC office auditorium. Special guest presenters will be Oliver Nicholls and Lachlan Bolton who took out the top two awards at this event last year and went on to win the top two national engineering awards and Oliver then went on to win the top international school STEM prize in the world in May this year with his Year 12 Design and Technology major project that he submitted for his HSC last year. 1st, 2nd and 3rd Prize-winners in each of the K-2, 3-4 and 5-6 age categories will be presented with certificates*. 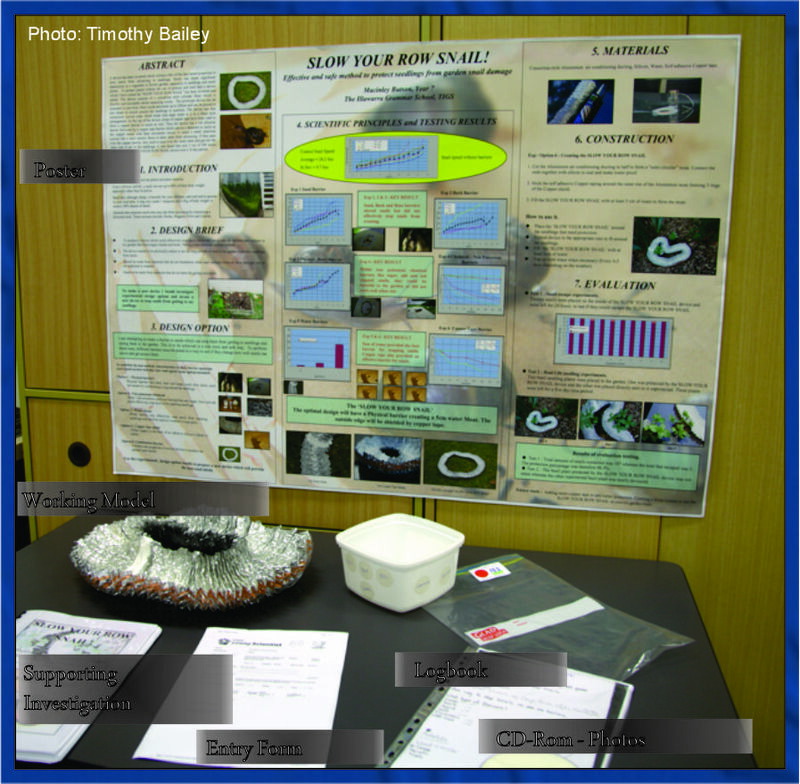 Students are to take their projects home with them at the conclusion of the Awards Ceremony. Selected technology and engineering project winners will be invited to represent NSW by entering the national BHP Foundation Science and Engineering Awards. These nominated national NSW representative projects will then have until the middle of October to prepare a 3-5 minute video and a 1000 word report for the national BHPFSEA competition. *Students will receive their cash awards at our major Young Scientist Presentation Ceremony to be held at the McKinnon Building, University of Wollongong main campus on Wednesday 1st November starting at 6pm. Our 2018 Young Scientist winners have been announced! 2018 Young Scientist Winners have been finalised!